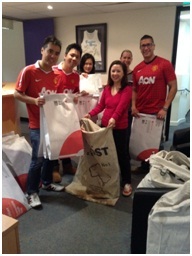 Support takes many forms and CREATE is a grateful recipient of some wonderful help from community minded organisations including AMP and AMP Capital, Aon, Origin, Dexus Property Group, QBE, Microsoft and many more. 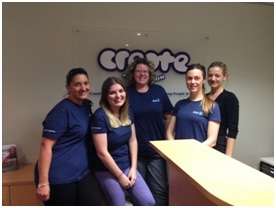 Some organisations fund projects or staff positions within the CREATE offices. Some provide mentoring to our team and many provide in-kind services and encourage their staff to participate in fundraising activities or volunteering opportunities. Whichever form it takes, corporate sponsorship is a gift that gives back when it inspires staff, customers and the community to reflect upon the good that they can do as a group. 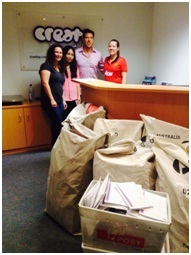 CREATE is very fortunate to have ongoing support from AMP for a number of projects. AMP Foundation is committed to providing volunteers on a monthly basis to write birthday cards for children in care across Australia. 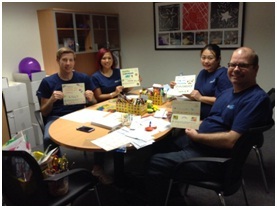 Often a team building event, not only do these cards bring joy to children who receive them, but they also allow AMP’s volunteers to express their creativity – all in the name of a good cause! As the number of children and young people entering care is increasing by 10% every year, our resources for reaching and supporting every young person are being stretched further and further. Most children come into care after being neglected or physically abused and through no fault of their own. It is often the case that they are quickly removed from an at risk situation in their home and taken into foster care – this means that there is little time for them to pack personal items or even toys and things with special meaning.